It’s mid February. The ice has been hit or miss so far in many states in 2017. Ice one week. Open water the next. 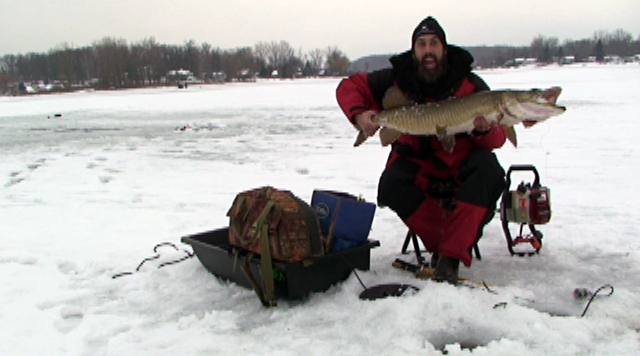 Although many think this is a bad situation for an ice angler, seasoned veterans like K & E Stopper Lures Pro Raymond Tiffany take full advantage of this situation. 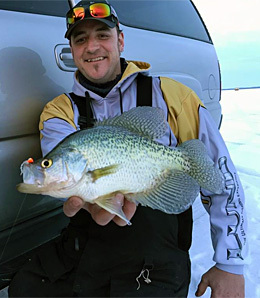 Warm weather and variable ice conditions mean only one thing when it all comes down to it… The fish have not been as heavily pressured by fisherman as they would normally be when ice conditions are solid. It makes for a perfect scenario to take advantage of some mid-late season giants, and catch them in a relaxed, unpressured state. While live bait is very popular with many, if not most ice anglers, Ray will almost always turn to finesse plastic tails for nearly every species. “You can offer the fish all of the same movements of live bait, with additional bite triggering movements, that you won’t get from live bait. Add in color concepts you will never find in live bait and the fish will eat,” states Ray! On this particular trip, the bite shut down within an hour and a half of first light. The school became lethargic and moved on. Ray was able to produce some dandy fish for a meal in that short period of time.